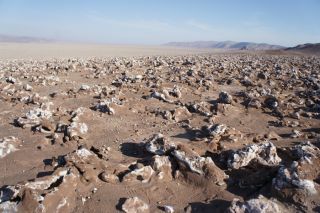 Halite fields in Atacama desert of Chile. Lindsay Borthwick, writer and editor for The Kavli Foundation, contributed this article to Space.com's Expert Voices: Op-Ed & Insights. That search isn't hypothetical. Scientists at NASA are planning missions to Mars and Saturn's icy moon Enceladus that may yield conclusive evidence of life on those worlds. But to get there, the research teams first have to decide precisely where to look and what signs of life to target. The Kavli Foundation brought together three prominent astrobiologists to discuss microbes and the search for extraterrestrial life. It's the second of a three-part series of roundtable discussions on the microbiome, the microorganisms that inhabit the Earth's different environments, from the soil to the human body. Part one, "Can Microbes in the Gut Influence the Brain?," revealed how the gut microbiome can influence human behavior and brain health. Steven Benner, president and distinguished fellow at the Foundation for Applied Molecular Evolution, a not-for-profit research organization in Gainesville, Fl. Benner works to create alternative building blocks for life in the laboratory and to apply this knowledge to astrobiology. Jocelyne DiRuggiero, associate research professor in the Department of Biology at Johns Hopkins University in Baltimore and a member of the University's Institute for Planets and Life. She studies how microorganisms adapt to extreme environments and what that can teach us about searching for life on other planets. Christopher McKay is a senior scientist in the Space Science and Astrobiology Division at NASA Ames Research Center near San Jose, Calif., where he investigates life in Mars-like environments on Earth and plans astrobiology missions to other worlds. The following is an edited transcript of the roundtable discussion, which took place via teleconference on January 12, 2014. The participants have been provided the opportunity to amend or edit their remarks. The roundtable preceded a webcast with McKay and DiRuggiero that took place on January 28. The Kavli Foundation: Research on microbes that inhabit the Earth's most extreme environments has helped to expand our knowledge of the limits of life. Jocelyne, how have those boundaries shifted in recent years? Christopher McKay: One particular area that Jocelyne has worked on that NASA is interested in right now is the ability of microorganisms to repair radiation damage. To me, it's one of the most fascinating and surprising extreme capabilities, and very relevant to going out in space where radiation levels are high. It's just unfathomable why these organisms would have the capability to survive extremely high doses of radiation when on Earth there is no such environment. TKF: So why have these Earth-bound species developed radiation resistance? J.D. : The idea is that those organisms are adapted to desiccation and that that adaptation also helps them resist radiation because the damage to cells is very similar. Steven Benner: Radiation causes damage to DNA by way of specific molecules, in particular, reactive oxygen species. These are created by radiation of many kinds, some coming from above, such as cosmic rays, and some from rocks, such as the decay of radioactive minerals. It makes little difference what the source of the energy is to create those reactive species. So while it's true that organisms living deep in the Earth are not exposed to the high-energy radiation found when you travel between planets, or more hypothetically between stars, the systems that cells have evolved to repair damage done by reactive oxygen species will be useful whether they arise from rocks or from cosmic rays. C.M. : As you've heard from Steve and Jocelyne, the story that is emerging is that organisms on Earth face one kind of danger and build a shield against it, and then that shield proves to be useful against other hazards, which may not be present on Earth but generate related challenges to the organism's survival and in their chemistry. S.B. : One of the most remarkable things that comes from this work on extreme microbes is that in all of the niches on Earth where Chris has looked for life — and he's certainly been looking among the farthest and broadest — you find that "life found a way": The basic chemistry that got life started has managed to adapt to fill whatever hazards exist in those niches. That's still correct, right, Chris? C.M. : Yes, it is. And even more surprising is that the life forms we find in all these diverse and unusual places are all on the same tree of life. We haven't yet, to my disappointment, found an isolated, obscure, little niche with organisms on it that are completely different and would be candidates for a different type of life. S.B. : Chris, what are the chances that you would recognize those as living organisms? C.M. : That's the rub. We might not recognize them even if they were there. TKF: I'll come back to that point, but first, can you tell me what technological changes have enabled the discovery of so many new forms of microbial life? J.D. : It's the molecular tools that we can now use to explore microorganisms in the environment. Before the invention of these tools we had to rely on our ability to grow, or culture, these organisms in the lab. But now, just by looking at some of their DNA, we can identify what they might be, and then if we sequence some of their genomes we can even get an idea of what type of adaptations they have to a particular environment. C.M. : What Jocelyne just said is fundamentally important. Literally 99 percent of what's out there wasn't being counted before, when we had only culture-dependent methods of identifying microorganisms. It's like looking in a room and seeing only one person in there until you turn on the lights and realize there are actually 100 people. That's roughly the change that these tools have caused. It may be even more than 100-fold, right, Jocelyne? J.D. : Yes. We're getting to what we call the "rare biosphere" —microorganisms that are in such low abundance that we couldn't find them or cultivate them before, yet sometimes they are essential to their communities because they carry out specific functions that other members do not. It's very exciting. This barren-looking rock, from the harsh Atacama desert in Chile, contains a surprisingly robust community of microorganisms. TKF: "Follow the water" has been the mantra of the scientific search for extreme microbes. But Jocelyne and Chris, your research has shown that microbes can eek out an existence in the driest place on Earth, Chile's Atacama Desert. How do they do it? J.D. : When we looked at the Atacama's soil we found very few microorganisms and they were dormant most of the time. But what Chris and others first discovered, and then what I did more molecular studies on, are rocks. We call these rocks our "islands of life in the desert." C.M. : In dry deserts in the Atacama, the Sahara, the Namib and Antarctica, it takes us a while to figure out where the water is. But when we figure it out, the organisms are there. They followed the water before us. S.B. : Chris, are you still of the opinion that if there is no water to be found, there'll be no life, full stop? C.M. : Yes. Nothing grows or reproduces when the water activity falls below some pretty high value, actually. It's not like phosphorus or other nutrients where organisms can adapt strategies to work with less and less and less. Microorganisms need surprisingly wet conditions. S.B. : So there's another limit to the chemistry that we all share. J.D. : But the advantage of microorganisms, at least some of them, is that they can be desiccated for a long period of time and resume metabolic activity when water is available. TKF: The human body plays host to about 10,000 different kinds of microorganisms. Jocelyne, how big are the microbial communities that you study in the Earth's most extreme environments? J.D. : In the Atacama, we can find a few hundred species, but there are four or five dominant ones, and then a long list of very rare microorganisms that are cohabiting and might just be waiting for a better time to take over and start growing. So there are many fewer than you find in garden soil or in the human gut. TKF: Chris, what has all this research taught you about how to search for life on other planets or moons? C.M. : It tells us that we have to think like a microorganism especially when it comes to water. And that translates into an appreciation that the amount of water can change from one place to the next on a very small scale. In the Atacama, as Jocelyne pointed out, the soils can be extremely dry and lifeless in one place and then right next to that may be a rock that's soaking up water and supporting life. The picture that we often have of life is as a big lawn spread uniformly over the hillside. Whereas in extreme environments, what we actually see is tiny niches that these microorganisms have found to exploit, and so we have to think that way when we search, particularly on Mars, for evidence of life or evidence of past life. S.B. : But keep in mind that the environments that we call extreme on Earth are actually rather mild compared to the environments where you might go looking for life in the solar system. A couple of days ago it was warmer on Mars than it was in Minnesota, but Mars is overall colder than Earth, as are Jupiter and Titan, the largest moon of Saturn. At some point the temperature drops to the point that alternative liquids, such as the liquid hydrocarbons we find in Titan's seas, become conceivable substitutes for water. We are exploring in the laboratory molecules that might support life in these environments, which are from our perspective far more extreme than any here on Earth. We're asking whether general principles that are not unique to life in Earth-like environments might guide our search for life that lives in very different environments. For example, as Jocelyne's work shows, microorganisms very often manage difficult problems in adaptation by forming communities. That might very well be a general principle for life regardless of the underlying chemistry. And it is something that can we learn about by looking at life on Earth. TKF: Steve, is that tendency to form communities a property that we could take advantage of to search for signs of life in other worlds? S.B. : That's right. There's no real reason why the chemical particulars of our proteins and nucleic acids, which are almost certainly in part a reflection of an historical accident, will be universal to life on Titan, or in Klingon life or life on Vulcan, right? So we need to think about what is universal to biology, regardless of its underlying chemistry. Certainly Darwinian evolution is universal, and some management of information associated with that would presumably be universal as well. TKF: Can we search for these universals? C.M. : Take a meta-look at life? C.M. : It's very hard to do. My job is to fly to other worlds and I need to create instruments to search for life on those worlds. How do I create an instrument that detects information and the ability of a system to record information and change in response to its environment? We don't have good answers to that. The one thing that we've come up with is that life on Earth uses molecules with a certain handedness, or orientation. Using a metaphor, life on Earth drives on the left side of the road. And that may be a powerful tool. S.B. : One could also look for metabolism signatures. If I examine a sample of the juice extracted from you, I will see a defined list of chemical compounds that have structural relationships between each other, reaction mechanisms that will convert one compound to the other and so on, and an energetic relationship between them as well. These are the signatures of an organized metabolism, and of life, no matter what the molecules that participate in that metabolism are. TKF: Okay, so what signs of life, or biosignatures, should we be striving to detect and are within our grasp technologically? C.M. : It's funny you ask because I'm giving a talk tomorrow in which I try to answer the question, If we do a mission to Enceladus, one of Saturn's moons, what should we look for? Enceladus has everything that we would have on our checklist for a habitable environment, including a plume of water vapor with organic material. If we were to fly through its plume, and we're proposing to do so, I'd suggest that the best molecules to measure are amino acids, the building blocks of proteins, because: one, we know how to measure them; two, there's lots of them and they occur naturally in the solar system, so we could expect them to be there; and three, life on Earth has made specific choices in amino acids. It uses a set of just 20 amino acids to build proteins, and those amino acids are all left-handed. But work by people like Steve Benner and others has shown that life could be based on amino acids other than that set of 20, and it could be based on another handedness, or orientation. If we fly through the plume of Enceladus, measure amino acids and find a bunch of them that all have the same handedness, even if they are different amino acids than the ones that support life on Earth, that would be very convincing evidence of a different type of life. Not fundamentally different like silicon-based life, but different enough that we would be sure that is doesn't represent a common origin with life on Earth. S.B. : I think Chris is on point here. Amino acids are extremely good ways of putting together functional molecules. It would surprise me to encounter a life form that works in water and is carbon-based, but that does not use the assembly of amino acids in some way. Amino acids are found all over the place, including in meteorites where they presumably originated without biology. So if Chris were to find amino acids in the plume of Enceladus, the challenge becomes determining whether they are the product of a biological process. If he were to find that they're all the same hand, that would be convincing, because that's what makes the protein evolvable. And we happen to believe that a higher-level biosignature is the ability to use Darwinian evolution to get the function out of functionless matter. J.D. : If you're flying through the plume on Enceladus, then amino acids are a great idea. But if you're digging in the soil of Mars, you want to look at other types of molecules like forms of lipids, or fats, that resist degradation. If you're looking at the atmosphere of exoplanets where we can't go, then you're going to have to look for different types of gases, such as oxygen. So, the question is really where are you looking and then what can you look for? TKF: Chris, you've mentioned Enceladus and Mars. But what are the best candidates in our solar system for life and why? C.M. : I would list them as number one, Enceladus, because of its plume. Number two, Mars and Europa. Mars because of evidence that it once had water, and it's such an Earth-like world in terms of the diversity of the surface environments. And Europa because it's clearly got a large ocean underneath the ice and tidal heating, which keeps its water liquid. Then in category three, I would put Titan, not because it has water but because it's got another liquid at the surface. And it's the only world besides Earth that has beaches where liquid comes up on shore, and that, as Steve was one of the first to point out, could be a liquid used for life. In the fourth category would be the other small worlds of the solar system like Ceres and asteroids and comets, which have tantalizing hints of water activity but no clear evidence of it yet. In the bottom category are Venus and Mercury, places that I wouldn't go to if they paid me. TKF: Has there been a particular discovery in the past year that has raised your hopes that we'll find evidence of extraterrestrial life, past or present? C.M. : For me, the most inspiring news was the discovery of Kepler 186f, which is the first Earth-sized planet in a habitable zone of a small star, and I think that is a benchmark in the notion that there could be life on other worlds. Jocelyne mentioned that one way to search for life is by looking for oxygen in the atmosphere of a world. That's something we can apply to this planet. We can't yet, because the telescopes aren't big enough, but we will. J.D. : I agree that the very large number of exoplanets is very exciting. But it's a bit like having a candy that you can't eat because we can't do the follow-up experiments to look for signs of life. So that's the issue for me. S.B. : What is Chris's excitement is our headache, because following the discovery of an Earth-like exoplanet, the problem gets kicked back to us. We get asked: What can you observe from a g-r-e-a-t distance that would be definitive evidence or even suggestive evidence of biology on this very, very interesting extrasolar planet? C.M. : True, we don't have the technology to look at the atmosphere of Kepler 186f. It is 500 light-years away. But the astronomers know what they would like to build to do that. So I predict that in 10 years we will have detected oxygen in Earth-size planets around Sun-like stars.